If you look, you will see. Observation is, after all, the basis for all the arts and sciences. When I look across the Pentland Firth I see two oceans meeting, swirling and colliding with each other in a fluid, renewing, vibrant ballet that allows the world to breathe. What you see in the governance of the UK is fear. Fear in those who rule over us and fear in those who are ruled. Fear is a weapon and a refuge. It destroys argument and aspiration and it forces us into the cave of our own shortcomings, watching the shadows flickering on the wall. It shuts us in so that we cannot see the possibilities of the natural world, the great dance of freedom and wonder. Our humanity shrinks as a result. Those who sailed across and worked on the Pentland Firth had a great respect for fear and for the sea, but they valued knowledge more. To know the sea is to survive. To know the Tory government in London, and the party that sustains it, is to overcome fear. But it is not easy. For the Scots, for all of us who call ourselves Scots whoever and whatever we are, colour or creed, it is a way of getting out of the cave and to dispel the shadows of doubt that flicker on the wall. It was Plato who first gave us the metaphor of the three men trapped in a cave unable to break free of their own illusions. I thought of this as I watched on TV the two Russian goons lying through their teeth, and almost unable to contain themselves from bursting out laughing, as they paraded their wiki-speak to back up their ridiculous story. This was only matched by the ridiculous stories and faux outrage which emanated from the Tory government. The level of sheer hypocrisy is staggering. It is as if they think the people on this island they keep calling Britain have no memory. Who knows, they may be right? But I have a memory and I can remember many, many things this government, and others, have done which have nothing to do with the advancement of freedom or democracy. But this crowd are slightly different. Even in the darkest days of Margaret Thatcher’s regime, in the mid 1980’s, when you looked at her cabinet, even if you thought they were monsters (and they were) you could not help but admit that they had a common purpose – the crushing of the miners and the working class in general, the privatisation of everything and some mumbo-jumbo about “Victorian values”. However, when you look at the current cabinet, and when you consider what they are doing, you see a depressing mess of individuals whose only commonality is their instinct to betray each other. They have no purpose other than their own advancement. Maybe it has always been like this in the higher echelons of British power politics? Yet it seems to me that in the seriousness of what Brexit will actually mean to us all and in light of the apparent cluelessness of the British government, the Roman antics of this feral shower have come sharply into focus. No wonder those two Russians could hardly contain their laughter. The Syrian poet Ali Ahmad Said Esber, better known as Adonis, wrote that “Every artist is an exile within his own language” and I see the wisdom in that as I try to make sense out of what I see unfolding in front of me. But it is a tricky business. Montaigne tells a story of when he was a young man he met his old friend, the doctor Simon Thomas, who was going to see a patient, an old man with “consumption”. The doctor himself was not well and indeed Montaigne himself had a bit of a cough. The doctor’s idea was that himself and the patient could at least reflect on Montaigne’s youth and vigour and that their general conditions, hopefully, might mutually benefit. More philosophy than medicine, Montaigne thought. “By filling all his senses with the flower of my youth he thought his condition might improve. 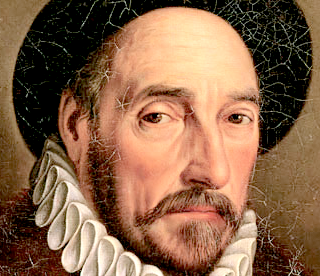 He forgot to add that mine might get worse.” Montaigne then concludes that the doctor “was made a fool by his own wisdom”. Such are the dangers which beset a Scottish socialist who longs for his country to become independent when discussing the plague dogs of Theresa May’s government. The very language you use exiles you in your own imagination. In fact Montaigne’s essay, in which I read that story about the doctor, was called “On the Power of the Imagination”. The current political predicament of the Scottish people (I’m one, so I can talk about them as if I know them all) is that constitutionally we have returned to the 1980’s and the West Lothian Question. What the EU referendum has shown us, as if we needed reminding, is that it does not matter a damn to the London government what the Scots think they are voting for or even if we vote at all. Our votes do not matter to them. How many of you can forget David Cameron on television the morning after the Referendum result in 2014 announcing “English votes for English laws.”? I understood then that they had learned absolutely nothing from the whole referendum campaign and the closely run thing it was. They have learned nothing from the EU referendum result either. What we must admit to ourselves is that the Conservative Party is incapable of learning anything. If that is wisdom then it makes us Scots look like fools. It is one thing for writers to become exiles in their own language, but it is quite another thing for the Scots to be exiles in their own country. Effectively this is what Britain leaving the European Union has made us. This month marks ten years since the financial collapse of 2008. The question is: what did the British state learn from that? Two things stand out in the pale headlights of a decade. The first is that they all breathed a sigh of relief that they got away with it. The second thing is they used the crash to make the poor pay. The real victim is local government. It is locally that the austerity programme is felt. Schools crumbling, maternity units closing, roads falling apart, social services in general being cut to the bone, all these are the direct result of a needless policy inflicted on the majority by a feral minority. Seemingly knowledgeable people with degrees in this and that will tell you honestly, and without a hint of a smile or a sneer (something George Osborne could never manage when he was Chancellor of the Exchequer) that “no-one saw it coming”. The truth is, I suspect, is that they chose not to see it. Because they knew what it would mean. Brexit is the tail-spin of the financial crash. To call the machinations within the Tory Party which led to the EU referendum in 2016 a right-wing coup is probably an over simplification but what we are witnessing, I think, is the machine eating itself. All the jockeying, back-stabbing, statements and counter-statements which passes for every-day reality within the inner circle of the London Tories is evidence that the British political system is in a state of chaos and will collapse from its own inertia. By inertia I mean it as defined in physics as “a property of matter by which it continues in its existing state of rest or uniform motion in a straight line, unless that state is changed by an external force.” The “external force” in this scenario is the Scottish people: us. In order to control “us” they must make us fear something else, something other than them, the government. That “other” has, over history, taken many forms and identities. It has been the Spanish, the French, the Turks, the Boers, the Germans, the Soviet Union, Iranians, all Moslems (it’s still them) but now it’s the Russians (again). The very people who, as opposed to the Soviets, should be our friends but who now, according to the statements released by the government and read out on the BBC and every other outlet as the truth, are our deadly enemies. Such reasoning, for the five and a half million living north of Hadrian’s Wall, makes us our own “other”. Our political aspirations, as Scots, have now become the enemy. In such double-think is democracy abandoned. The Salisbury incident has made many ask awkward questions of the British government and if the answer is constant bleating of “Novichok” then you know there is something not quite truthful going on. When both sides of the story are lying then what hope is there for truth? Truth for all governments is a relative narrative. Again the Syrian poet Adonis sums it up when he wrote that “Reality is nothing but skin that crumbles as soon as you touch it”. In the 1930’s the English ex-diplomat and raconteur, Jack Philby, or Harry St John Bridger Philby, CIE, to give him his full moniker, was driving out in the desert with his pal King Saud of Saudi Arabia. They were looking for a water well. The King confessed to Jack that his country was in bad place. The British backed Faisel, his rival in the north, even though they had lied through their teeth to him before and after World War One. King Saud told Jack Philby that his country was broke, so much so that he, the King, had to carry his “treasury” around with him in a bag. Philby asked the King, “Have you ever thought about exploring for oil?” The King replied that this would indeed be a great idea. But how could it be done? Jack Philby knew exactly how that would happen. Instead of going to Anglo-Persian Oil, of which the British government owned 51%, (the same government that had just got rid of him), he went to see John D. Rockefeller and Standard Oil of America, the “anaconda” of oil capitalism. A deal was struck, and King Saud got $275,000. This was fine until after World War Two when the Saudi’s realised that Standard Oil was paying more to the US taxman than Saudi Arabia was receiving from Standard Oil. The Saudi finance minister went to see Standard Oil, or ARAMCO as it became, and said “The old deal is dead. The new deal is 50-50.” The American oil men didn’t like it, but they knew they had to agree. Half of a fortune is better than nothing. Meanwhile the Iranians saw what was going on and in 1951 their finance minister said to the Anglo-Iranian Oil Company, as it had become and would then go on to become BP, that they also wanted a 50-50 deal. The British told them that was impossible. The Iranians, quite sensibly, then nationalised all the oil and gas assets in their country. In 1952 MI6 and the CIA (who were terrified of the Soviets getting a foothold in middle east) organised a coup to oust the democratically elected Iranian government. The Prime Minister Ali Razmara was assassinated, his successor Mohammed Mossadeq was arrested, the Shah fled and in 1953 the pro-Western general Fazlollah Zahedi was put in power and the Shah returned. BP thought everything had gone according to plan, except the Americans insisted on a 50-50 deal with the new Iranian regime, the very thing the British had orchestrated the coup against in the first place. Their greed and their racism, not their wisdom, had made them foolish. Jack Philby, the man who set all these events into motion, was the father of Kim Philby, the notorious double agent who defected to the Soviet Union in 1963. What has this got to do with Scottish independence? Well, it is an example of what the British State does. Do we also need reminding of the death of truth in 2002 which led to the invasion of Iraq in 2003? What dubious plots are we likely to witness in Scotland in a post a no-deal Brexit Britain when the demand for a second referendum on Scottish independence grows and grows? Both Plato and Montaigne (in his own sweet way) were philosophers and philosophers are very patient people – they can argue about something inconclusively for 3,000 years. Most people are far less patient and politicians are the least patient of all. All we have to do in Scotland is to be patient. The Russians were laughing because they know Britain is a busted flush. They know that the reality is that the City of London is Russia’s organised crime laundrette. This hypocrisy makes us all exiles. Let us be patient and show them that fear does not work. If we succumb it will, literally, cost us the earth. ISBN-10: 184921171X ISBN-13: 978-1849211710 will be launched at The Central Hotel, Thurso at 7.00 pm on Thursday 27th September with music from Andy Thorburn. Did Adonis offer any advice on commenting on an article that isn’t written? There was some discussion recently on what kinds of articles Bella Caledonia runs, and I think news and opinions were the most prominent types. I’m sure there are others, but one kind that Bella seems a bit light on is the short formal philosophical essay which uses accessible language to explore a focused idea with some rigour, to form a better question that might be answered. You can probably find modern examples by Julian Baggini or A C Grayling easily enough. They should be straightforward enough so that if you don’t agree with their conclusions or reasoning, you can spot exactly where you differ. My sense is that there is a reluctance to rigourously define one’s philosophy of the good life in an independence movement because people fear it will turn out that someone’s idea is to live in a house made of gold, another is to frolic in some tartan clandom, while someone else longs for a pastoral idyll, and yet another wants a community of gender-neutral cyborgs. And then the movement will fall apart because people really do have very different ideas. But maybe not. Maybe having real, rigorous, adult discussions about the truly important things in life will produce some kind of working consensus. I don’t think it is the philosophers who are arguing inconclusively here. And many apparently lived the lives they advocated, like Diogenes and Epicurus. The frightening thing about philosophy, for devotees of the status quo, is that it really can change the way that people think. I think the philosopher is someone who can be at ‘home’ wherever they are in the world. They have to care that we vote. We voted in 13 Tory scumbags in 2016 and this 13 are what is keeping this present government in power. In the whole of the 20th century there was only one occasion when the votes of the Scots made a difference to a UK election. And that was the latter Labour government of Harold Wilson in the 1960s, a government so weak and divided it was unable to do anything. In the 21st century the votes of the Scots have kept in power another weak and divided government, this time Tory. But the stakes are so much higher and yet these 13 Tory scumbags of the Ruth Davidson party are nowhere to be seen trying to gain any advantage for Scotland or their constituents, the majority of whom must have voted Remain as did the whole of Scotland, from the Brexit negotiations. Utter disgrace. Ruth Davidson’s kidding on she’s not really a Tory has been responsible for bringing in this shower but she has done zilch for her country through this leverage. Zilch. I think the only true fact I can see at the moment is that Theresa is an anagram for the arse.